We all know that humans have two hands, and when it comes to shopping this can present a bit of a problem. If a customer in your store tries to buy more than 3 or so non-hangered, mid-sized item then they are already struggling. And once that person has run out of hands and elbow crooks to hold their products, they will stop browsing and head for the checkout. Crucially, don't put them in the Transition Zone - otherwise known the store entrance. As we'll explain in our upcoming blog, this is not the best place to place your shopping baskets. Customers won't really "see" them in this area of the establishment as they are still acclimatising to the new surroundings they've just walked into - and hence are likely to breeze by without stopping. Place the baskets a little further inside and get that measly 10% figure up, whilst increasing sales in your retail store. The likely response is a smile from your customer (people like being helped) and a grateful acceptance of the shopping basket. After all, holding a basket is preferable to being hampered with no hands left to touch and read other items in the store. When this technique was trialled in a discount drugstore, customers almost unanimously accepted the baskets and the average sale value increased too. Think about how baskets feel for the user. Are you a grocery store or supermarket manager still using traditional metal mesh baskets? Do they bash against your thigh uncomfortably when they get too heavy? Or perhaps the two straight handles that come to meet in the middle cut into the palm of your hand? How would your customer go about putting in a slim, small item in like chewing gum without it falling through the gaps? 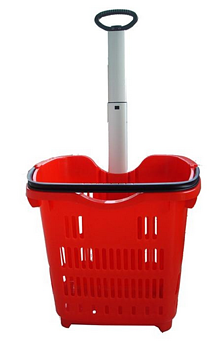 In this case think about switching to plastic baskets with only one large handle, they are lighter, and some even come with wheels. You could even copy the clothes retailers and go for a hard bottomed, canvas bag so customers can bear the weight on their shoulder rather than fingers and wrists. The plus side for you is that textile baskets don't take up as much storage space. Make carrying items a little easier for your customers. As we've already pointed out - the more basket usage, the more sales. Remember, size matters for your particular type of retail: for example, furniture retailer Pfaltzgraff found increasing basket size by 40% also increased average sales per customer. Well it's one way to get rid of your old stock of baskets, should you have decided to change them since the test on tip number 4! But some retailers like Old Navy have taken it a step further. The attractive black mesh tote bags they offer as baskets are in fact buyable at the checkout should the customer wish, counting as a last minute sale. Plus, it gets your brand a little free advertising as they bag gets used outside of the store. Bags for life are all the rage nowadays, with most shoppers buying them at the counter then using them again and again when it comes to packing. The only niggle, I realized today, is that I had to carry my bag for life in addition to the basket. My advice: when you sell a reusable bag, have sure your cashiers point out that these bags can be used in place of shopping baskets - to keep your customers hands free to pick up even more items. Let us know in the comments box below about your own experience with shopping baskets whether you're a customer or a store manager looking to increase retail sales.